Last January I attended HOMI Milano for the first time. I was familiar with the exhibition but didn't quite know exactly the type of products and services showcased. I got the invite to check it out, and so I flew in to Milan. It is held at Fiera Rho, where iSaloni usually takes place. I was impressed with the level of organization and the number of exhibitors.We even got to be a part of their new announcements for 2019, which was nice. HOMI Milano focuses mainly on homeware including cutlery, tableware, home accessories, special decorative pieces, in addition to everything related to fashion. My main focus was on the halls that were related to interior design. I got to meet several exhibitors and learned about their products. Many of them I already knew but was happy to receive their latest updates. How is HOMI different from the other exhibitions? At iSaloni, immCologne, and iSaloni, for example, you will find more furniture brands, many are higher ticket items. These exhibitions include some finishes, homeware, furniture, sometimes fabric, etc.. As for HOMI, I felt it highlighted accessories and homeware much more, barely any furniture was present. There was an entire hall focusing on Christmas decorations, which makes it a great place for wholesalers and vendors. Another thing I noticed was that the price range was more on the affordable side both for the home and fashion products. I also liked the fact that the date of the exhibition changed from September to January, right after Maison & Objet which makes it convenient for those already in Europe at that time. 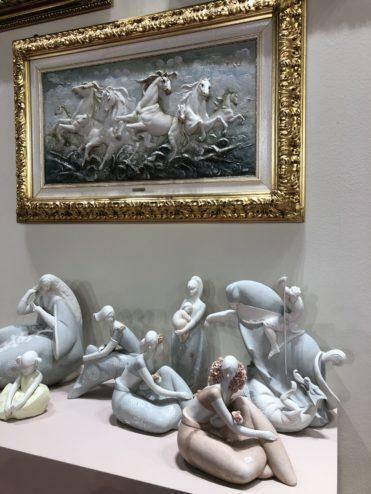 I am sharing in this post a couple of slide shows, one with some pieces at HOMI and the other from my visit to Milano. On my instagram highlights, I have some images of the fair. There is also a gallery with more images on their website.